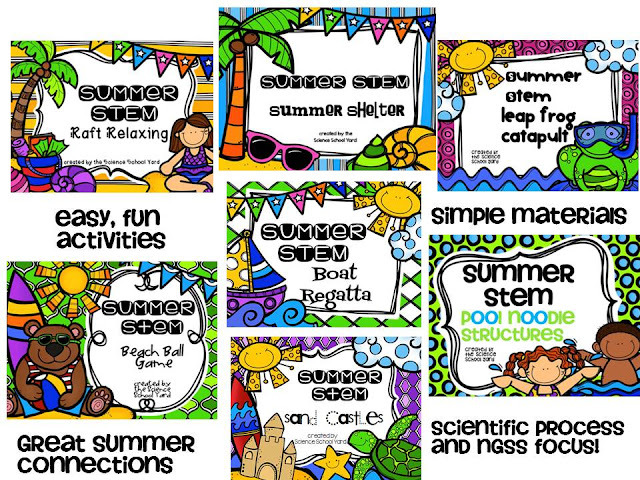 Summer is a time for slowing down, relaxing, and STEM! I was challenged by a dear science friend who is teaching summer school this year to find something for her kiddos to do when she needs a little pick me up or has a little time to fill during her summer school day! Something that could take 10 minutes...could take 30 minutes...but as a science teacher during the school year she wanted to find something that could get her students excited about science during the summer time! I was up for the challenge! I needed to make these activities affordable as well as the materials needed to be easily set up for her to use when the time came for her to fill it with STEM Summer Fun! For each pack...I made a booklet that she can print back to back, a center card, and writing connections! I can't wait to see if the kiddos like them! Check them out at Science School Yard TPT Store under STEM Summer Fun!